“It is with a great sense of sadness that I write of the death of Robert McGregor, of Napier. 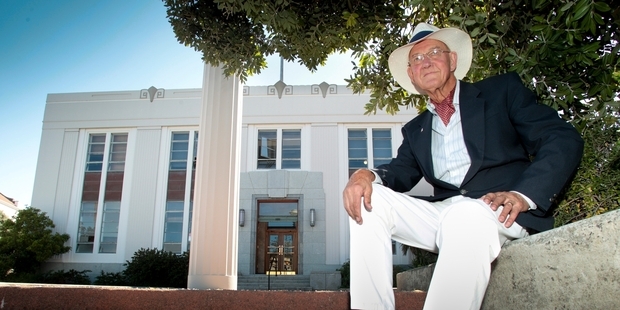 He was many things: a father to Angus and Isobel, a grandfather to two adorable grandchildren, the much-loved husband of Helen, as well as a former Director of the Hawkes Bay Art Gallery and Museum, a neighbour, a friend, a once wanna-be architect, and above all, a lover of the Art Deco architecture of Napier. He was the man behind the start of the Art Deco group in Napier, which I joined a couple of years after its start in the 1980s. It grew, and kept growing, becoming incorporated as the Art Deco Trust, and growing in importance both economically and spiritually as the driving force behind Napier. He is, was, and always will be, the Art Deco man to many. Robert was immensely well read in architecture, capable of writing endless articles on this much-loved city, and possessing a tactical brain that could out-think and out-last many others. Robert also possessed a decently caustic tongue – he didn’t suffer fools at all, and no doubt made a few people feel the lash of his wit along the way. But that is what made Robert the truly pivotal figure in the Napier scene over the past 30-40 years. Initially the Art Deco Trust was a small-time, two-bit organisation without the financial backing to have much clout. Robert’s continual vision for the Art Deco Trust was always bigger, better, stronger, and more influential – an early discussion between him and an early Napier mayor ended with the Mayor saying that the interest in Art Deco was just a passing fad, and that the city would be better off to allow and encourage demolition of the curious architecture that surrounded the people of Napier. At that stage, it is fair to say that many people in Napier probably agreed with him. Robert decided that the best course of action was education of the public, and intensive publication of Napier’s architectural heritage worldwide. The mayor and his vision are long gone, but the vision of Robert and the Art Deco Trust will live on for ever. 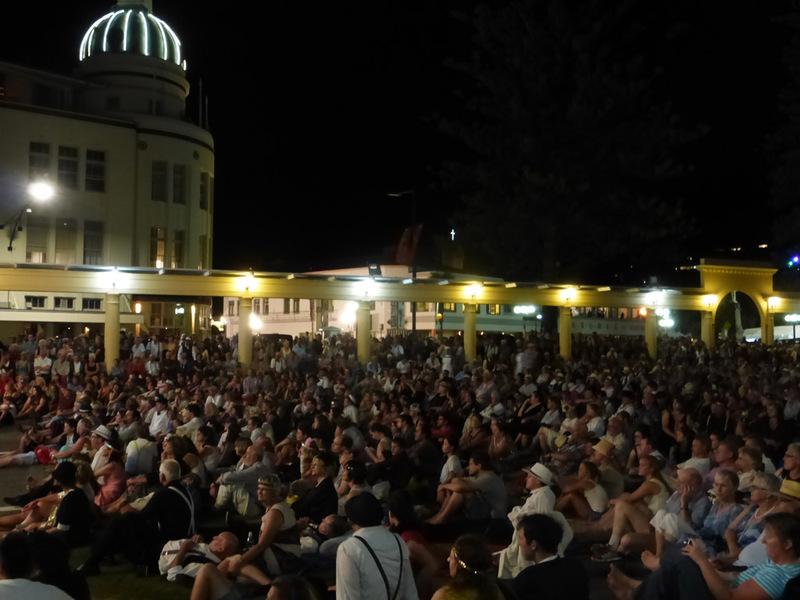 The first Art Deco walk, organised by Mary Johnson and Robert, was a raging success, with over 1100 people making a tour of the city they had lived in all their lives – and seeing it for the first time in a new light via Peter Wells with his stylishly deco film “The Newest City on the Globe”, about the rebirth of Napier from the ashes after the 1931 earthquake and fire. Others deserve credit for their part in the resurgence of Art Deco Napier as well – of course Peter Shaw with a series of books about Art Deco Napier, and recognition should go right back to Heather Ives and her original book for the Ministry of Works on Art Deco Napier. But the main credit has to go to Robert McGregor and his untiring energy for the subject of Napier’s architecture. Long before anyone else, he recognised that the architecture we have in Napier – actually a mixture of Louis Hay‘s rework of early Frank Lloyd Wright and Louis Sullivan, along with a smattering of Spanish Mission style and some stripped classical buildings, along with a light dusting of truly Art Deco features. He had the marketing savvy to play up to these strengths, and I remember the day when the Art Deco Trust committee voted to spend what seemed then like an enormous sum of money to commission a Post-card for sale, complete with Art Deco buildings on the front. Staggeringly, up until that post-card was produced in the late 80s, Napier scenes were only available with “dolphins in Marineland”, “lambs in spring-time” or the delectable Maori maiden “Pania of the Reef”. Napier now has not just one art-deco post-card, but many: books, articles, deco trinkets, a resurgence for men wearing sensible straw boaters, and a reputation known internationally as The Art Deco City, and all – really – thanks to Robert. The Council had to eat its own words when, in 1988, The Art Deco Trust was given a government grant for about $38,000 for Art Deco features – which was a lot of money back then – and the Trust would carefully dish it out to assist Council on restoration projects such as street signs and art deco styled manhole covers. At that stage, the Trust had a turnover of only about $5,000 or $10,000 a year, but now it turns over in excess of a million or more each year. Napier wouldn’t be the booming tourist success story it is today without its reputation as the Art Deco City – cruise ship passengers love it when they glide into this small town. The key event of the tourist season is no longer the Hastings Blossom festival or the A&P show, but of course the Art Deco Weekend – which pulls in regular appearances of the Navy, the warbird acrobatic team, and about 30,000 people attending weekend art-deco themed events, many sitting late into the night listening to jazz bands while dressed in full 1930s regalia. People having fun. A city reborn. And… the newspaper catches up and notes Robert McGregor’s passing as well. Has the Roger Walker Curse moved on to Athfield now?